People were talking about the new Fusion. Conversation on social media was overwhelming positive during the launch of the new Fusion. Everyone that saw the car seemed to have something good to say about it. Our idea was to find them and thank them. Real people showed their love for Fusion in the real world, and we gave it right back. We gave one Baton Rouge resident their very own Autoshow on their front lawn. We sent Fusion fans Thank You gifts that were tailored to the comments we found online. 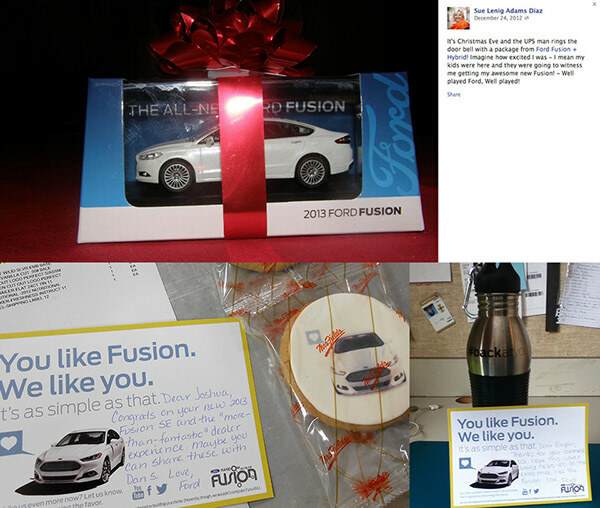 Through this massive social campaign, we created various ways to thank fans who were saying great things about the new 2013 Fusion online. From featuring their comments in our videos featuring actor / comedian Paul F. Tompkins, to putting on an autoshow in a fans front yard. It was our way of showing our fans how a little thing they say can go a long way.